Posted on June 29, 2017 at 11:58 am. CUSTOMER DAVE HOGAN (PICTURED LEFT) AND LIFESTYLE CO-OWNER KEITH CARROLL (RIGHT) ENJOY A FEW LAUGHS. AS PART OF LIFESTYLE’S 150TH SUMMER CELEBRATIONS, LIFESTYLE HOME PRODUCTS IS PHOTOGRAPHING SOME OF THEIR GREAT CANADIAN SUNROOMS. WE LOOK FORWARD TO SHARING THE RESULTS WITH YOU IN THE COMING MONTHS. 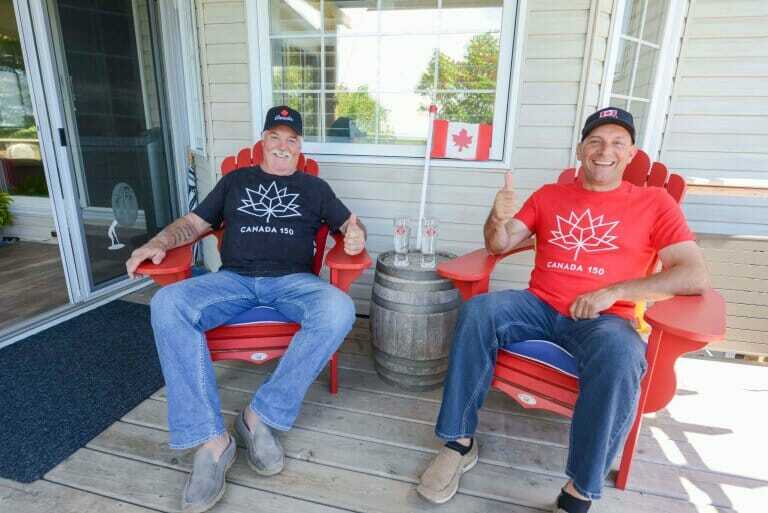 It all started with a Canada Day party. 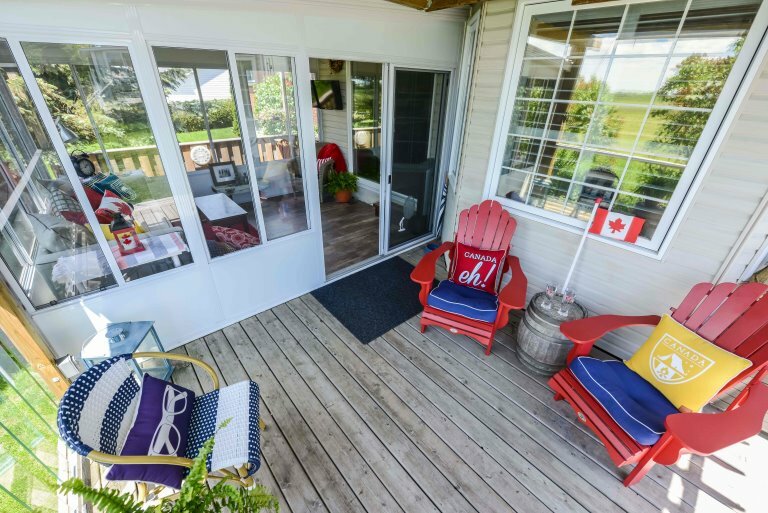 In the spirit of that theme, Elaine Hogan selected Canada flag pillows for their newly-built Lifestyle sunroom. That inspired Lifestyle Home Products, Canada’s leading sunroom manufacturer, to photograph the Hogans’ sunroom in honour of Canada’s sesquicentennial. Dave and Elaine Hogan had Lifestyle Home Products create and install a custom-built sunroom that would complement their ranch style bungalow’s rural-facing backyard. Dave, a retired Toronto police officer, wanted a room that would take the place of a cottage setting close to nature. 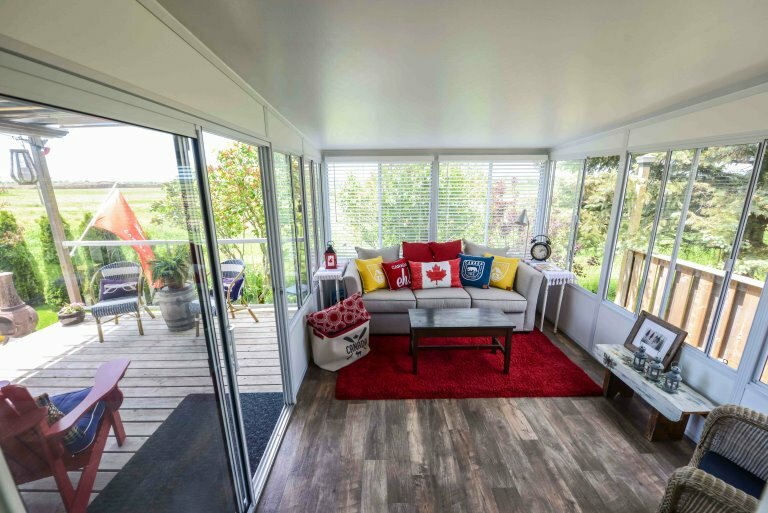 When the couple hosted their Canada Day party last year, the sunroom became a focal point. It started to rain, and the sunroom offered welcome space directly off the back deck for many of their 30 guests. Due to the use of high performance, Low-E glass and the company’s manufacturing and installation process, Lifestyle sunrooms offer optimum efficiency for the Canadian climate. A Lifestyle Grand Oasis Sunroom Addition opens up a wall to add a comfortable year-round indoor/outdoor room, while Lifestyle’s Oasis Plus Sunroom is a separate room that can be heated efficiently and enjoyed year-round.